We had a client with CRM 2011 On premises IFD environment that no-one could log in to today – approximately 1 year after deployment. It turned out that the ADFS Token-decrypting and ADFS token-signing certificates rolled over as the default validity for them is 365 days. 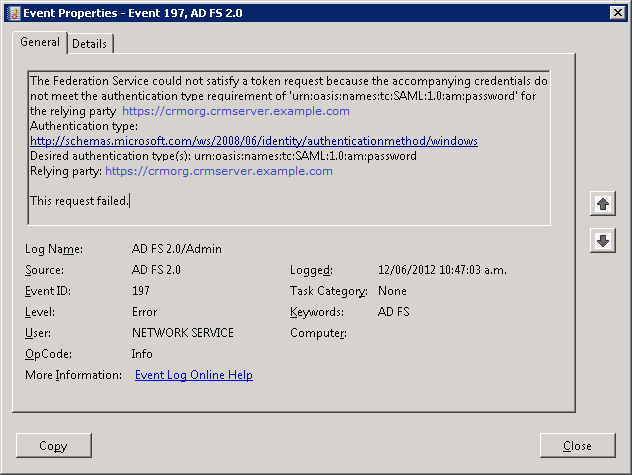 While the new certs were rolled over OK, we were getting authentication errors and no-one could log on to CRM. We had some CAPI errors in the Application Event Log indicating invalid 3rd party trusts which I assume were related to the recent Microsoft certificate revocation of certificates in reaction to the Flame malware saga. 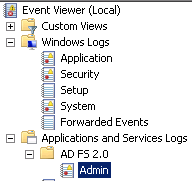 We also had token request errors in the ADFS 2.0 Admin Event Log “the federation service could not satisfy a token request because the accompanying credentials do not meet the authentication type requirement of ‘urn:oasis:names:tc:SAML:1:0:am:password’ for the relying party https://crmorg.crmserver.example.com”. I had suspected that the CRM Claims/IFD Configuration had cached some of the token details, including perhaps the certificate thumbprints, and now they were not being accepted. Manually update the Federation Metadata for each of your CRM Relying Party Trusts for your CRM server in ADFS/Trust Relationships, and clicking the “Update from Federation Metadata …” action. Hopefully a future CRM Service Release might fix (or have already fixed) this. If not, then be prepared to either mark this date in your calendar and repeat the process every year, or reconfigure your ADFS to use certificates for signing and decrypting that last a bit longer than the default 365 days. This entry was posted in Claims Based Auth & Internet Facing Deployment (IFD), CRM IFD Deployment, Dynamics CRM and tagged #msdyncrm, ADFS, CRM 2011, IFD, Internet Facing Deployment. Bookmark the permalink. I’ve spent an entire day tracking down what turned out to be this exact problem. Thanks to you and this post, I can sleep tonight. Thanks! I had the same problem. These instructions solved it. Thanks a lot! Yes, you will have to re-load or update the certificate on all your websites. Make sure you include the version with the private key. If you used the Wildcard cert as the Token Signing/Decrypting certificate on ADFS 2.0 then you will have also have to load the new ones there, promote to primary, and re-configure the CRM claims/IFD (to make CRM recognise and load the new certificate info). When you load the new certs, make sure to give the appropriate user (e.g. Network Service) access to read the private key of the cert. This cant be done every year when the ADFS token certificate renews itself and we cant expect the services to go down every year knowing that this would happen. Solution: Put this script in your ADFS server. Thanks, that looks like a great solution for Office 365 federation. I haven’t seen one around for CRM On Premises though but it should be possible as there are powershell commands for configuring claims/IFD for CRM On Premises. Microsoft Dynamics CRM 2013 – aka ORION – on its way! Dynamics CRM 2011 SDK Version 5.0.14 – What’s New?